Explanation: Presently at opposition in planet Earth's sky, Saturn is well placed for telescopic observations. On Wednesday two amateur astronomers took full advantage of the situation from Melun, near Paris, France. 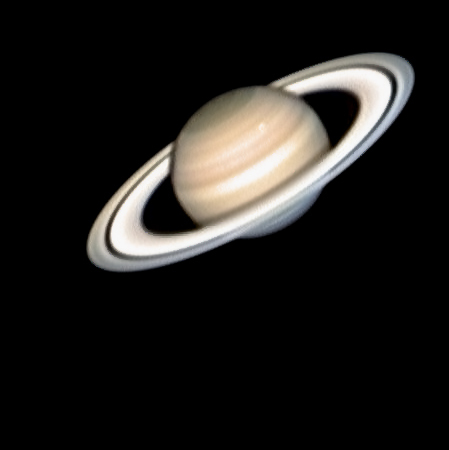 With a 12 inch diameter telescope and web cam they recorded this sharp image of the ringed gas giant and made an exciting discovery -- a new storm on Saturn. The storm appears as the white spot visible here in Saturn's southern hemisphere (south is toward the top in the picture). In particular, the storm seems to correspond with an outburst of radio noise detected by the Cassini spacecraft. The phenomenon is likely similar to the Dragon Storm recorded by Cassini's instruments early last year. That storm is thought to be analogous to a terrestrial thunderstorm, with radio noise produced in high-voltage lightning discharges.